Mallorca is sunny and warm and after our last few days in chilly Provence. W,e are making the most of it. 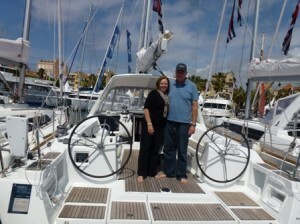 We moved from Puerto Portals to a marina in Palma. Still parked next to big beautiful yachts but this marina is not quite as large nor are the boats. The first morning, the Guarda Civil were on the dock, busily chaining a 75 foot ketch to the dock, ostensibly because the owners haven’t paid their marina fees for a few years. The bill is Euro 200,000. We will make sure the marina fees are paid before we leave. Packing away leggings and jackets, getting the boat ready for the rest of the season, this has been the past week’s activities. Since yesterday was Sunday, we decided to take a drive up to Polença and stop in some lovely towns along the way. This was virtually a drive down to Cap Blanc and then a drive up the east coast of Mallorca. 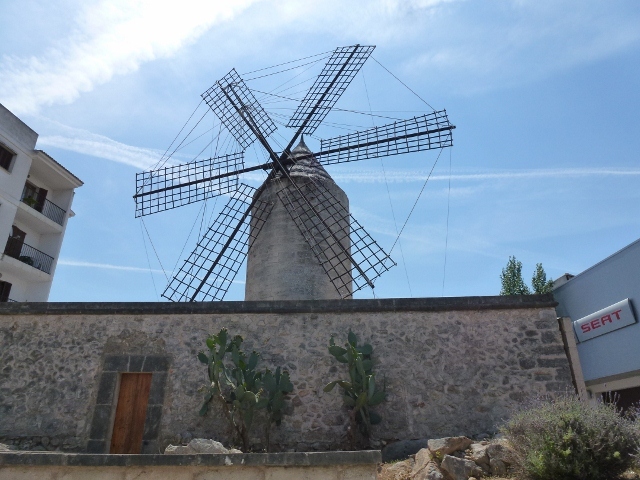 We left Palma and headed for Santanyi, a 700 year old town near the Natural Park of Mondrago. We drove through the large town of Manacor which looked like a thriving centre of commerce. We had a lovely lunch in Artà, a very old and lovely town that seems to have been preserved from the development rampant on much of the island. The tiny street our restaurant was on seemed to be pedestrian traffic only, so you could sit outdoors under an awning and relax with gazpacho and salad. We left for Alcudia and the National Park of s’Albufera and on the way passed major developments of condos, resorts and villas. Many of them going for a nice price as the area has overbuilt and the banks are worried. One set of resorts will be catering to the Germans and the next will be catering to our friends from the UK. We stayed overnight in a nice resort in Polença for E62 per night. Bargains abound. We arrived at Alcúdia, ambled through the cobbled streets of the old quarter, with laneways and one or two story stone buildings through out. 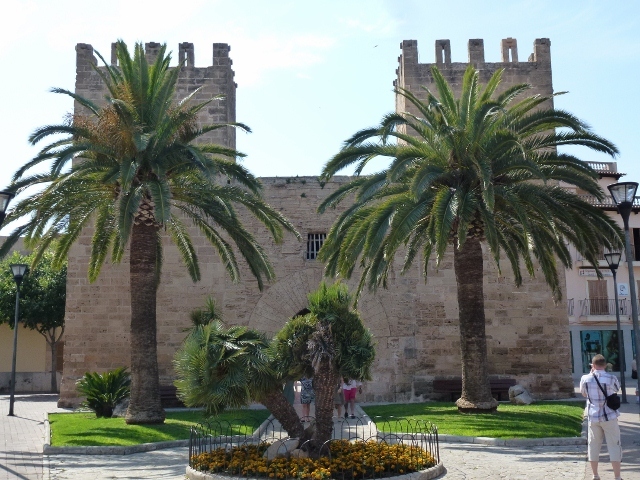 Alcudia has kept it’s heritage and thankfully the condo developers haven’t managed egress here. It is lovely to walk around and people watch. 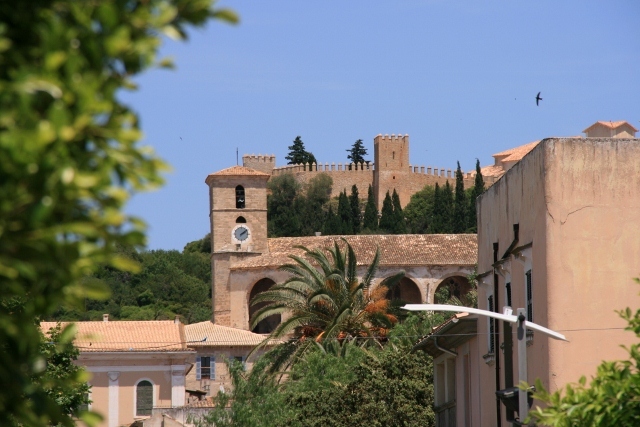 Alcúdia is developed on Roman ruins and the fort like walls were built in the 1300’s, to protect landowners from pirates and rebelling peasants. We left Alcúdia after climbing to the top of the walls and roaming around the cobblestoned streets and squares for Polença and it’s port. We aren’t sure if we will be able to sail into Port Polença, as we may draw too much water but we would love to spend more time there. Monday morning, back to wait for workmen to get Mercier into better shape. Hope you enjoy the photos. Monday, we were hopeful of departing for Palma and left Bandol with high expectations. The wind was about 20 knots and the seas were very choppy coming out of Bandol Harbour. We thought it will calm down once we are outside, but no. As we sailed out the winds moved up to 30 knots, then 35 knots as we sailed in the Gulf of Lion, which has a fierce reputation. We decided its reputation was well deserved and went back to Bandol. It wasn’t just the wind making the sail uncomfortable but very confused seas and a chill in the air to rival Tasmania’s. Today was just to be seven hours of practice. We came to an agreement – we leave on the next sunny day, which gave us two more days in wet and chilly Bandol. Luckily, Bandol has wonderful restaurants and if the weather was wet and chilly, the wine certainly warmed us up. Finally on Tuesday afternoon, the sun came out; we agreed that we would brave the Gulf of the Lion once more. We departed early on Wednesday morning. This time it was manageable, Mercier sailed well in 20-25 knots, but the sea was still confused. At one time, I could see waves approach the boat from three or four different directions. We were visited during the day and evening by dolphins who would ride the wave bow for awhile. They didn’t mind the weather at all. By the time we sighted Menorca the seas were flat and winds were light. 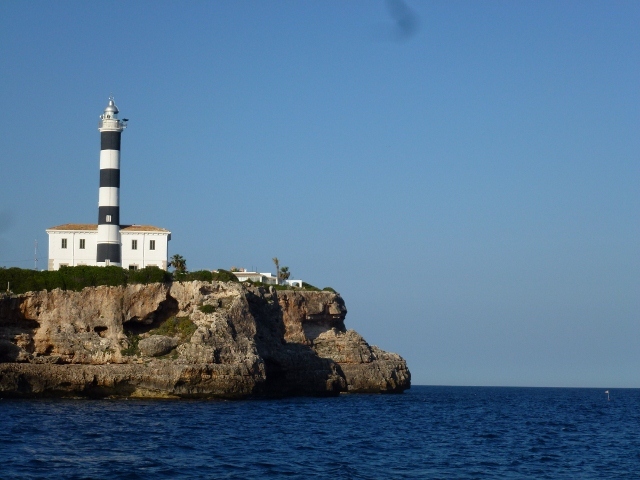 It was great to sight land and it wasn’t too long before we were motor-sailing along the coast of Mallorca. This was the Med of my dreams, azure blue seas sailing past rugged cliffs and lighthouses, viewing modern villages in the hill side. We pulled into Porto Colom about 7:30PM and anchored just inside the harbour. The waterside was active and we could hear dogs barking and see children playing along the harbour beaches. The houses are a rich white against the blue skies, very picturesque. We set sail at 7AM, the sea is a pane of glass. It’s easy to see the 17 metrest to the bottom. We are motor sailing, as there is no wind. We are hoping to be in Palma for lunch. We finally received our safety kit, loaded it on board and returned the rental car. All ready for an early start on Saturday. We awoke on Saturday morning, ready to go, breeze was forecast as 20 – 25 knots from the east, so it should be an easy reach to Palma, some 300 miles away. We fuel led up at Toulon Old Port and motored out of the Harbour. 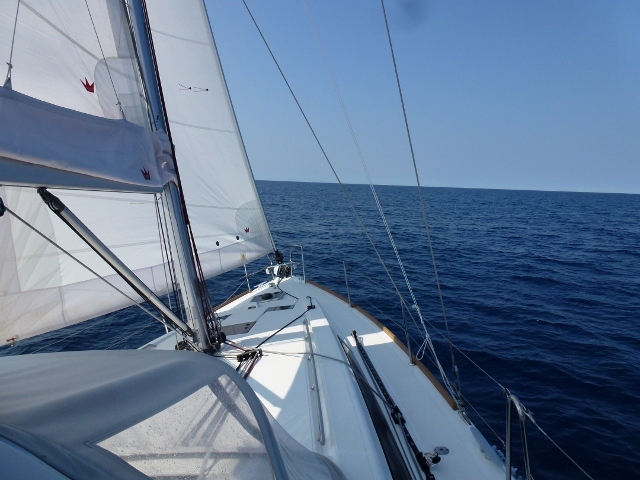 The way out of the harbour was upwind so we motored for about an hour until we could unfurl the jib (but only 2/3 out) We then set course for Palma, only to find that the wind had increased to 30 knots and it was very uncomfortable. Given that this was our first sail and we were still not familiar with the boat, we decided to sail to Bandol which was downwind most of the way. wind was now gusting to 35, so we knew we had made the right choice. Arriving in Bandol just after mid day, we went alongside at the Capitanairre and had to wait until 2pm for them to return. Thankfully they found us a berth and we then set about mooring the boat, wind was gusting up to 45 knots at this stage, so mooring her was quite a challenge, however we got lots of help from the boats either side and we managed to get in without damage. The harbour master was a great hand and the bow moors to a chain which is in permanently in place. After a nice dinner ashore at a locals cafe, we retired for the evening only to be woken at 3am by a bang – the bow line had chafed through in the windy night. Managed to re-moor and go back to sleep. Looking at the weather forecast it appears we will probably be here for another night. Bright and early this morning, James was up and applying the signwriting to Mercier, first the Squadron Emblem, then the name and finally Sydney. There were a few expletives, although most were muttered, so as not to scare the neighbours. Today was a public holiday, so no boat business, we decided to revisit Aix en Provence. Arriving at lunchtime, we strolled through the colorful market without buying to get to a lovely brasserie for a meal. This market has homewares, mainly linen as well as women’s clothing and shoes. After lunch the markets were closed but we were able to walk around the old town and see a few shops open and look inside, many others were closed, but the people watching was fairly amazing. Three young men walking around in white lab coats with painted formulas and pictures, singing and hooting and generally having a good time. Crowds of tourists and holiday makers filled the streets, which are mainly pedestrian thoroughfares. As we were walking down a busy street full of pedestrians, I noticed a young girl about 3 years old. Very confident and curious, Mademoiselle 3 was having a grand time. We thought it was odd that she didn’t follow her Mother into a shop, but thought she was near other family. A few blocks later on, we realised she was still beside us and we began to realise she was lost. Even a confident 3 year old shouldn’t be walking around Aix on her own. So I said Ou est Maman? I went blank on my French and told her to come with me with hand gestures. We retraced our steps and about two blocks back we see a lady running and looking frantic. Mademoiselle trois, who gave a shout to her very pregnant mother, who burst into tears as soon saw little Ms 3 year old. A happy reunion and also happy for us, because we were worried even if Mme 3 wasn’t. We finished up in the Park at La Seyne Sur Mer for the Salon Espirit du Vin, which was an exposition of wines from the region, France, Alsace and Corsica. We tasted several and bought a few for the Mercier cellar. They also had lots of truffles, condiments and foods from the same regions. All in all, even though it wasn’t a boat day it was very enjoyable. Remember reading A Year in Provence? The chapter when they are trying to renovate and the materials are always coming the next day or the next… We are experiencing our own bit of laissez-faire here because the safety pack didn’t make it. Tomorrow is a holiday, so we are stuck in limbo until Friday. 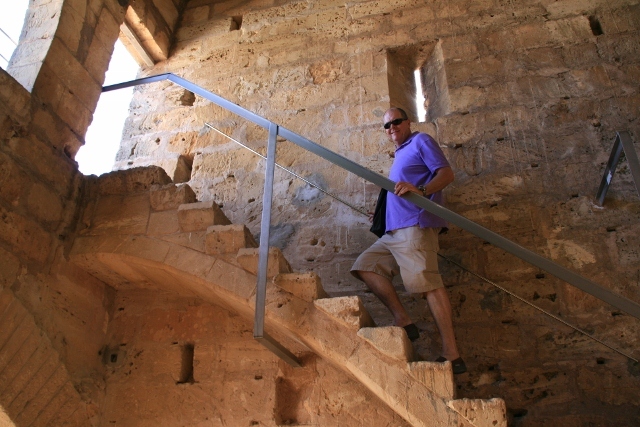 Maybe we will take a jaunt up to Chateau neuf de Pape? And Aix en Provence will be close by. The wind makes the boat strain and dance to St Vitus’ tune. Tonight we will dream of sailing to Hobart, but at least we won’t be on the weather rail. Well we bought a boat – a near new Beneteau Oceanis 41 which is hull number 1 of this series of boat – it has had a fair amount of use as it was used in the brochure, and has been to 4 or 5 boat shows. Getting down to the basics, it is amazing how much is required to start getting a new boat equipped. As this was a demo boat there were a number of things which still needed to be finished before we can set sail. We have spent the last 4 days in a village called La Seyne Sur Mer near Toulon which is a bit industrial, but still lots of boats here. We have to take the boat on a 2 day journey to Palma to have a few final details finished. Even before this we need to add a pallet of safety equipment and then there was the radar which had not been installed. Simon from the Sunbird dealership, is being very supportive, proactive and has helped us move through the list and get some faults corrected. Watching them put up the radar in some very wild winds was nerve wracking but the team of people putting it together were very professional and also helpful with a few other items like getting the Mp3 to run through the sound system. We are naming her, Mercier, which was Grandfather Merrington’s first yacht and being a French name, seemed to fit. We considered Bandol Rose, but we think there may be a few boats with that name and tradition won the day. Speaking of Bandol Rosee, the local wines are very tasty and light. If we are running errands around lunch time and just have a mineral water, the waiters are terribly despondent and can’t understand how we can have our lunch without the necessary libation. We are making progress – can’t wait for the sail to Palma. Sadly, we are home again to put our dearest sailor to rest. Vale, Bill Merrington, who sailed most of his 98 years on Sydney Harbour and several oceans. His first hello always seem to be about boats, sea breezes, racing and sails. His stories were of the glorious camaraderie and competition of ocean going family and friends. Bill ensured his family were all introduced to an elemental love of the sea, whether through racing or long weeks of camping on Cowan Creek on the Eventide. Ms Lette says “The price of love, of course, is grief”. That thought resonates with us today, but we remember there was so much love and laughter and because we will miss that, we are sad but we will always hold you dear to our hearts. Bill, we will miss you, Wishing you fair winds and a following sea.